ATTITUDE knows everyone wants the best for their families. 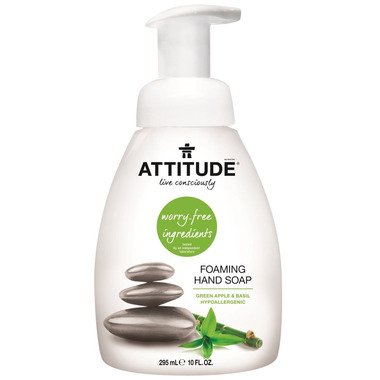 That’s why they offer ATTITUDE Foaming Green Apple & Basil, a natural and efficient option to clean hands. Even though chemicals linked to cancer are legally tolerated in hand soap, we don’t think you want them in your home. I agree with other reviewers who disliked the scent; I found it smelling weird, sweat-like... not something I want my hands to smell like. If it was just the "green apple", or just the "basil", it would be fantastic as the product really works. Sadly, I also purchased the large refill bottle of this stuff together with this dispenser, so we're kind of stuck. It will be used, eventually, and maybe in time we will get used to the scent. I like the fact that it is Canadian made but I just don't like the scent. I like using this soap, but I have found that one in three bottles become non-functional after less than half the contents have been dispensed. I got this because it was on sale. Good hand soap. Wish it came in more appealing scents.